The "precedential" effects they are talking about are the numbers of similar cases that the Navy will have to deal with if the precedent is set by this repatriation, and the answer is, according to Chris Dickon, author of The Foreign Burial of American War Dead (MacFarland, 2011), very few. (See Note from Chris below). There are only a handful of similar cases, and they are not identified remains, so their families, unlike the Somers and Wadsworth families, are not seeking their return. So it is an unfounded assumption by the military that if this goes through they will be swamped with similar requests. On the other hand, there are plenty of historical precedents to support the repatriation. 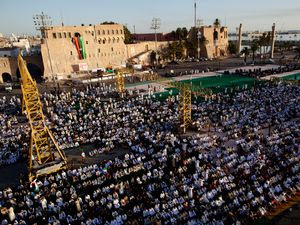 Shortly after the Libyan revolution reached Tripoli, and Green Square became Martyrs Square, not far away a convoy of armed militiamen pulled up to the front door of a local mosque where, with picks and shovels, they dug up the 100 year old remains of a revered Sufi saint and made off with it. The same act was repeated many times throughout Libya as orthodox Islamic extremists try to impose their will on the Sufis and other moderate Islamists who revere their saints. While the Tripoli Military Council claims no laws have been broken, they defer to the religious council to see if it is a sin to bury saints in mosques, as the extremists claim. In Sirte, at the same time, the graves of Mommar Gadhafi’s mother and family are desecrated, as the lack of legal or civil authority has allowed for violent crimes to be committed with no retribution. 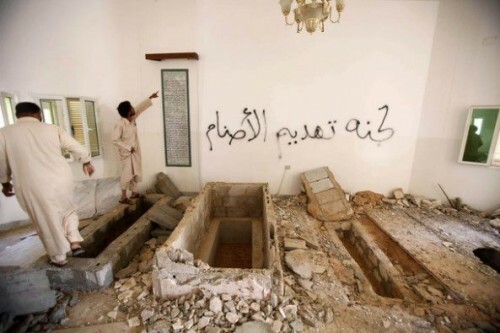 The grave of Gadhafi's mother was vandalized and desecrated. To attack and vandalize graves is apparently a natural and legal act in Libya, which places the graves of the Americans naval heroes at Old Protestant Cemetery in Tripoli in a precarious jeopardy even though the Navy had officially declared that is to be their final resting place. 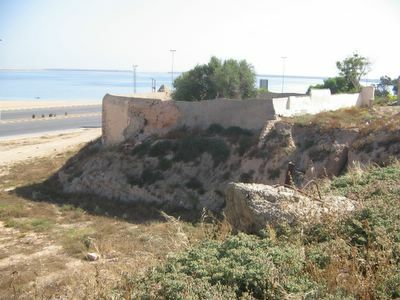 The cemetery itself, although walled, is not far from the threatening tide waters of Tripoli harbor, and is also surrounded by a major highway and encroaching development that has claimed much of the area. According to a Libyan study of the cemetery, more than half of those who have been buried there over the past hundred years have been removed and reburied at more secure locations. Nevertheless, the Navy has declared the cemetery as the “final resting place” for the American naval heroes, although a new evaluation has been ordered by Congress to determine the feasibility of their repatriation. As part of that order historical precedents of similar repatriations has been requested, so I’ve compiled some of them here. The first major precedent is that of John Paul Jones, the hero of the American revolution who was on a special mission when he died in Paris. He was unceremoniously buried, without any American participation, in a lost crypt that was only located because of an inquisitive diplomat. President Theodore Roosevelt ordered an American warship to retrieve his remains and John Paul Jones was reburied, with much fanfare, at the chapel of the US Naval Academy at Annapolis. Roosevelt and others used the occasion to give speeches and promote the mission of the US Navy. In 1930, during the Italian occupation of Libya, the Italian army uncovered the remains of five of the Intrepid sailors while building a road and the plaza that is now Martyrs Square, and reburied them in crypts at the Old Protestant Cemetery. 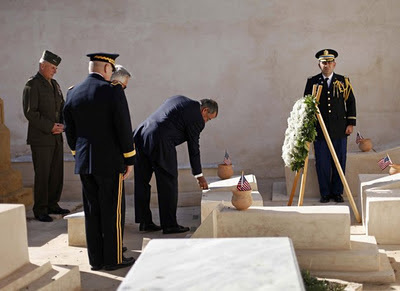 In 1938, at the request of President Franklin Roosevelt, they were discovered there by Tripoli harbor masters Mustapha Burchis, and based on Burchis’ research, the US Navy held a ceremony at the cemetery in 1949, and placed markers on their graves. After World War I and World War II the families of those who died in combat abroad were given the choice of leaving them where they were buried on the battlefield, having them reburied nearby at an American military cemetery maintained by the American Battle Monuments Commission (ABMC) or repatriated home to be reburied at a veterans cemetery. The ABMC maintains a large cemetery in Tunisia, 200 miles from Tripoli, where many World War II veterans are buried, but the ABMC refuses to assume responsibility for the maintenance of the graves of the Intrepid sailors in Tripoli. The exhumation and movement of historic remains that have been laid to rest is not uncommon, as President Kennedy’s grave at Arlington was moved in a secret night time military operation in 1967, and the Tomb of the Unknown Soldiers was opened so the remains could be DNA tested at the request of a family. When the missing soldier was positively identified, his remains were removed and reburied in a marked grave, just as those in Tripoli should be tested and moved. Stephen Decatur, one of the heroes of Tripoli, had commanded the Intrepid on the mission that scuttled the frigate USS Philadelphia. Decatur was popular at home and had considered running for President before he was killed in a duel of honor and buried in Philadelphia. His widow however, continued living at their home in Washington near the White House that is now a National Historic Landmark. When she died Mrs. Decatur was buried in a small grave near her home that later became an impediment to the expansion of a major university, so her remains were exhumed and reburied next to her husband in Philadelphia. The remains of the three officers and ten men of the Intrepid in Tripoli can be positively identified, as modern technology has made that possible. When the wreck of the Henley, a Civil War era submarine was discovered and recovered, it was found to contain the remains of a number of sailors who were positively identified and reburied with full military honors over a hundred years after they died. More recently, the old Italian Cemetery in Tripoli was renovated after many of the graves were desecrated, and thousands of remains were exhumed and reburied or repatriated to Italy and other countries. Among them were 72 Americans who had died in Tripoli, relations of US servicemen assigned to Wheelus Air Force Base. At that time – in the fifties and sixties, the US government and US military did not pay for the return of remains of the relations of servicemen who died while stationed abroad. But the US government in 2007, shortly after the resumption of diplomatic relations with Libya, did it all at once, repatriating 72 in one day. The POWMP/Accounting Command is responsible for accounting for the remains of all of those US military personnel who are lost in combat, and that includes the men of the USS Intrepid. They search for, locate and repatriate the remains of hundreds of American combat heroes every year, often without any publicity or public notice, and they are very good at what they do. Now the Senate/House Armed Services Committee Conference has ordered an evaluation and report on the feasibility of repatriating the remains of American naval heroes in Tripoli, a study that many believe is designed to stall the repatriation effort, whitewash the truth and leave them where they lie, in a broken down cemetery and in unmarked graves under a parking lot at Martrys Square. But any study of the history and the precedents for such action clearly indicate that repatriation of the remains of these men from Tripoli can be done, must be done, and is a mission that the US military, however reluctant, can and should do. These articles are important because they take the story international. They were translated into Arabic and read by Arabs all over the world; it is probably their first introduction to the issues, and they are probably amused by the idea of American suicide bombers. WASHINGTON, Dec. 26 (UPI) -- Congress is pressuring the Defense Department to repatriate the bodies of a U.S. Navy crew that perished off the shore of Libya 207 years ago. The battle to bring the remains of Capt. Richard Somers of New Jersey and his 12 shipmates has been going on for decades, Stars and Stripes reported. Now, in the wake of the uprising in Libya, Congress is again requesting the Navy repatriate the bodies. Somers' mission in 1804 was to sail the explosive-filled Intrepid into Tripoli harbor and blow it up amid a fleet of pirate ships. However, the Intrepid exploded in the harbor before reaching its target, for unknown reasons. "When these bodies washed ashore, some pretty horrible stuff happened. They were drug through the streets, fed to dogs, and worse than that, and then thrown into a mass grave," said Rep. Frank LoBiondo, R-N.J. "There's been an ongoing effort, by a dedicated and now-expanded group, to try to get them back on U.S. soil." The Navy has resisted the efforts, citing a tradition of honoring the final resting place of those lost during service. "Right now, the Navy's position has not changed," said Lt. Lauryn Dempsey, a Navy spokeswoman. "The chief of naval operations considers the Tripoli Protestant Cemetery to be the final resting place." In its most recent effort to pressure the Navy to retrieve the bodies, Congress passed a bill, which is awaiting a signature from President Barack Obama, that orders the Navy and the Department of Defense to review the feasibility of recovering the remains and report a recommendation back to Congress, Stars and Stripes said. Somers Point Mayor Jack Glasser said he is pessimistic about the results of the measure. "We're hopeful they come back and say, 'OK, we can do this,'" Glasser said. "But our fears are that they come back and say it costs too much money for whatever reasons. Or that someday they'll have another regime change over there and they'll desecrate these remains and they'll be lost forever." TRIPOLI, Libya, Nov. 2 (UPI) -- A U.S. group trying to bring home the remains of 13 sailors killed two centuries ago off the shores of Tripoli says it is pushing for support from the military. Supporters of the drive to bring the fallen sailors from the USS Intrepid home to the United States say they're hopeful the recent leadership change in Libya will push forward the effort to repatriate the fallen heroes, The Baltimore Sun reported Tuesday. A congressional bill that passed in May included an amendment authored by U.S. Reps. Mike Rogers and Frank LoBiondo that would require the Defense Department to return the bodies of the 13 sailors buried in mass graves in Libya since 1804. "The United States has an obligation to leave no member of our military behind, regardless of how long ago they were killed," Rogers said when the bill was passed. The sailors were killed when their ship exploded in Tripoli Harbor while on a mission to destroy Tripoli's fleet during the First Barbary War. When their bodies washed ashore, they were fed to a pack of dogs and then dumped into two mass graves, Rogers said. Rogers said he joined the effort to bring the remains of the Navy commandos back to the United States for a proper burial after visiting the grave sites in 2004. The Defense Department has been reluctant to embrace the group's repatriation efforts, saying the sailors received a proper burial during a graveside ceremony in Tripoli in 1947. US navy resists bid to take back remains of 1804 crew. WASHINGTON. The US Navy crew perished more than 207 years ago, but an effort to repatriate their remains is getting new attention in Washington. In the wake of the liberation of Libya, members of Congress are pressuring a reluctant defence department to bring home the bodies of Captain Richard Somers of New Jersey and his 12 shipmates. But the navy has resisted, saying that a graveyard in Tripoli is their final resting place. Somers’ mission during the First Barbary War was to sail the explosive-filled ketch Intrepid into Tripoli harbour on September 4, 1804 and blow it up amid the fleet of pirate corsairs. But the ship exploded in the harbour before reaching its targets, either because the crew members came under enemy fire or blew themselves up to prevent their load of powder from being captured. All on board were killed. Somers was a native of Somers Point, an Atlantic County town named for his great-grandfather, a major Colonial-era landowner. Supporters say, at least as far back as 1840, Somers’ sister asked for her brother’s body to be brought home, and efforts in Congress to order repatriation go back decades. A December 1980 story in The New York Times, for example, noted that then-Rep. Harold C. Hollenbeck, RNJ, was hoping incoming president Ronald Reagan would be more receptive to his effort to require repatriation than outgoing president Jimmy Carter had been. The navy has resisted the efforts, citing a tradition of honouring the final resting place of those lost on ships and downed aircraft. “Right now, the navy’s position has not changed,” said Lieutenant Lauryn Dempsey, a Navy spokeswoman. WASHINGTON - The U.S. Navy crew perished more than 207 years ago, but an effort to repatriate their remains is getting new attention in Washington. In the wake of the liberation of Libya, members of Congress are pressuring a reluctant Defense Department to bring home the bodies of Capt. Richard Somers of New Jersey and his 12 shipmates. But the Navy has resisted, saying that a graveyard in Tripoli is their final resting place. Somers' mission during the First Barbary War was to sail the explosive-filled ketch Intrepid into Tripoli harbor on Sept. 4, 1804, and blow it up amid the fleet of pirate corsairs. But the ship exploded in the harbor before reaching its targets, either because the crew members came under enemy fire or blew themselves up to prevent their load of powder from being captured. All on board were killed. Somers was a native of Somers Point, an Atlantic County town named for his great-grandfather, a major Colonial-era landowner. Supporters say, at least as far back as 1840, Somers' sister asked for her brother's body to be brought home, and efforts in Congress to order repatriation go back decades. A December 1980 story in The New York Times, for example, noted that then-Rep. Harold C. Hollenbeck, R-N.J., was hoping incoming President Ronald Reagan would be more receptive to his effort to require repatriation than outgoing President Jimmy Carter had been. The Navy has resisted the efforts, citing a tradition of honoring the final resting place of those lost on ships and downed aircraft. "Right now, the Navy's position has not changed," said Lt. Lauryn Dempsey, a Navy spokeswoman. "The chief of naval operations considers the Tripoli Protestant Cemetery to be the final resting place." The remains had been moved to the cemetery in 1930 after being discovered by road builders. 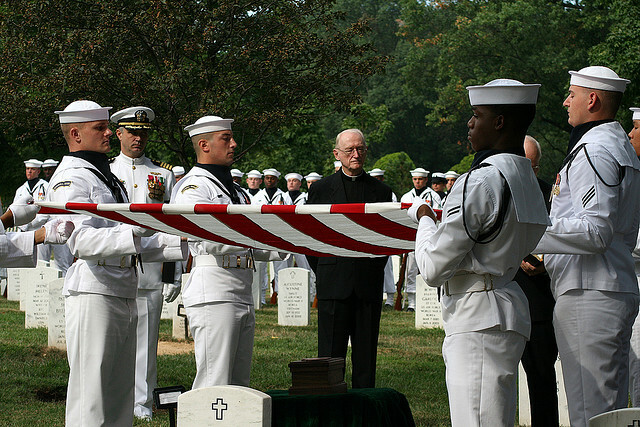 After World War II, the Navy held a formal memorial ceremony at the cemetery in 1949. The recent uprising in Libya provided a new opening for Congress to press the issue this year, and a bill now on President Barack Obama's desk orders the Navy and the Department of Defense to study the feasibility of recovering the remains and report a recommendation back to Congress within nine months. LoBiondo and others preferred an outright mandate, and included one in the bill that originally passed the House. But LoBiondo said the top-ranking Republican and Democratic chairman on the Senate Armed Services Committee, Sens. John McCain of Arizona and Carl Levin of Michigan, agreed with the Navy and stripped references to the Intrepid's crew from the bill. LoBiondo was able to get the compromise language added back as a member of the House-Senate conference committee. Defense Secretary Leon Panetta visited the cemetery in Tripoli while in Libya on Dec. 17, but he did not mention the call for repatriation. Instead, he talked about working with Libyan officials "to ensure that this very special place remains an honored and protected landmark for both of our nations." Advocates for returning the sailors' remains are happy Congress has taken some action, but they're far from confident it will produce results. "We're hopeful they come back and say, 'OK, we can do this,'" said Somers Point Mayor Jack Glasser. "But our fears are that they come back and say it costs too much money for whatever reasons. Or that someday they'll have another regime change over there and they'll desecrate these remains and they'll be lost forever." LoBiondo said he has "a lot of respect for Mr. Panetta" and wasn't pessimistic yet. "I wonder if maybe he didn't have the whole story about the desecration of bodies. He's a very thoughtful, patriotic individual. When the whole story unfolds, hopefully, he'll be in agreement," LoBiondo said. 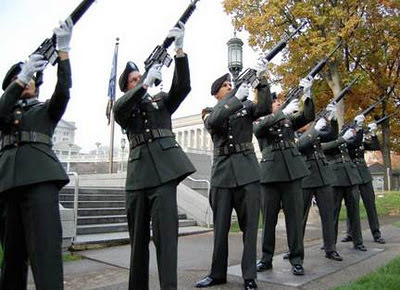 The National Military Examiner publishes military and military-related content that often misses mainstream media, including all troop losses. For instant updates, please use the SUBSCRIBE icon on this page and view more military articles from across the nation on Facebook at the National Military News Examiner. Thank you for reading and thank you for supporting all of America’s boots on the ground and all the ships at sea! Merry Christmas! For the first time in history a United States Secretary of Defense visited Tripoli, Libya, and paid tribute to Navy Lieutenant Richard Somers and his crew of sailors who died aboard the USS Intrepid during the first Barbary War in 1804. 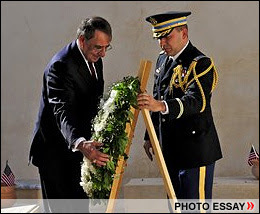 Saturday (Dec. 17, 2011), Leon Panetta laid a wreath on the graves of the sailors who were interred in Tripoli’s Protestant cemetery. The 2012 Defense Authorization Act includes a provision that requires the Defense Department to begin the process of identifying and returning Lt. Somers and his crew to U.S. soil and to report back to Congress the feasibility of recovering and positively identifying the missing sailors. Examiner’s Note: To some the task of identifying 200 year-old remains might seem impossible unless you know the story of the H.L. Hunley, the Confederate submarine that sank in Charleston Harbor in 1864. The remains of those onboard that ill-fated submarine have been identified. Bill Kelly: Thank you Susy for pointing out the latest technological advances make it possible for positive identification of even centuries old remains, and the identification of the men of the Hunley by the Smithsonian scientists certainly indicate the same techniques can be applied to the remains of the men of the Intrepid. Both the Somers and Wadsworth families have offered to provide DNA samples to use to attempt to positively identify Master Commandant Richard Somers and his first officer Lt. Henry Wadsworth, and the third officer Lt. Joseph Israel can be identificated using the same methods. H.L. Hunley was a Confederate submersible that demonstrated the advantage and danger of undersea warfare. Although not this nation's first submarine, Hunley was the first submarine to engage and sink a warship. Privately built in 1863 by Park and Lyons of Mobile, Alabama,Hunley was fashioned from a cylindrical iron steam boiler, which was deepened and also lengthened through the addition of tapered ends. Hunley was designed to be hand powered by a crew of nine: eight to turn the hand-cranked propeller and one to steer and direct the boat. As a true submarine, each end was equipped with ballast tanks that could be flooded by valves or pumped dry by hand pumps. Extra ballast was added through the use of iron weights bolted to the underside of the hull. In the event the submarine needed additional buoyancy to rise in an emergency, the iron weight could be removed by unscrewing the heads of the bolts from inside the vessel. On 17 February 1864, the Confederate submarine made a daring late night attack on USS Housatonic, a 1,240-ton (B) sloop-of-war with 16 guns, in Charleston Harbor off the coast of South Carolina. H.L. Hunley rammed Housatonic with spar torpedo packed with explosive powder and attached to a long pole on its bow. The spar torpedo embedded in the sloop's wooden side was detonated by a rope as Hunley backed away. The resulting explosion that sent Housatonic with five crew members to the bottom of Charleston Harbor also sank Hunley with its crew of eight. H.L. Hunley earned a place in the history of undersea warfare as the first submarine to sink a ship in wartime. In August 2000 archaeological investigation and excavation culminated with the resurrection ofHunley from its watery grave. A large team of professionals from the Naval Historical Center's Underwater Archaeology Branch, National Park Service, the South Carolina Institute of Archaeology and Anthropology and various other individuals investigated the vessel, measuring and documenting it prior to preparing it for removal. Once the on-site investigation was complete, harnesses were slipped underneath the sub one by one and attached to a truss designed by Oceaneering, International, Inc. Then after the last harness had been secured, the crane fromKarlissa B began hoisting the submarine from the mire of the harbor. On August 8 at 8:37 AM the sub broke the surface for the first time in over 136 years where it was greeted by a cheering crowd in hundreds of nearby watercraft. Once safely on its transporting barge, Hunley finally completed its last voyage back to Charleston, passing by hundreds of spectators on Charleston's shores and bridges. The removal operation reached its successful conclusion when the submarine was secured inside the Warren Lasch Conservation Center in a specially designed tank of freshwater to await conservation. All who viewed the vessel said Hunley incorporated an unexpectedly graceful and beautiful design. It is certainly a marvel both for its time period and for modern day researchers. No doubt this small submarine will be the key to unlock many mysteries of a bygone era. Several teeth, packed in a small narrow box surrounded in foam material, were laid in a neat row. Gold fillings gleamed like tiny percussion caps on the molars and an incisor. One filling was cast in a silver amalgam material. This was not a dental office. It was Dr. Doug Owsley's office at the Museum of Natural History in Washington, D.C. We were peering at the teeth of Lt. George E. Dixon. He was commander of the H.L. Hunley, the Confederate submarine that disappeared off the waters of Charleston, S.C., on the night of Feb. 17, 1864, after sinking the USS Housatonic. Owsley, the head of physical anthropology at the Smithsonian Institution, worked with a team of scientists, including Department of the Army forensic genealogist Linda Abrams and medical examiner Dr. J.C. Upshaw Downs, the chief medical examiner for the state of Alabama and a former resident of Charleston. Eight men were aboard the Hunley when it sank for the third and final time. Five of the crew drowned on Aug. 29, 1863, and all eight crew, including the sub's namesake and benefactor, Horace Lawson Hunley, were lost when the Hunley went down again on Oct. 15, 1863. Both times the Hunley was salvaged. After the third sinking it took 136 years before the sub was raised. The information that Owsley and Abrams share about the third crew provides a fascinating look at the lives of these courageous men who crewed the first submarine to successfully attack and sink an enemy ship. Every available space in Dr. Owsley's cramped offices is filled with cases of skulls and bones gathered over the years for research. In the midst of this vast collection Owsley moves around quickly. He is an amicable host who is constantly asked to lend his expertise when a skeleton is found. At the moment he is analyzing two young female skeletons discovered after wild animals had scattered the bones. He was asked to examine the remains found in the sediment that filled the Hunley. The skeletons were well preserved, allowing Owsley a rare opportunity to thoroughly analyze the remains and provide some details about the crew. Each set of remains, and any artifacts discovered near them, was meticulously cataloged. Owsley shared his notes on two of the crew, BB and AA. The youngest member of the crew, identified by Dr. Owsley as BB because of his position inside the submarine, was a Caucasian male whose bone age was from 19 to 22 years and whose femur histology (tissue structure of the thighbone) was recorded to be 21.8 years. He was also the shortest crewmember. According to Owsley's findings, "He would have been the least cramped and had the greatest ease of movement within the submarine". The young man's vertebrae showed some wear, a "strain induced deterioration of joint surfaces." 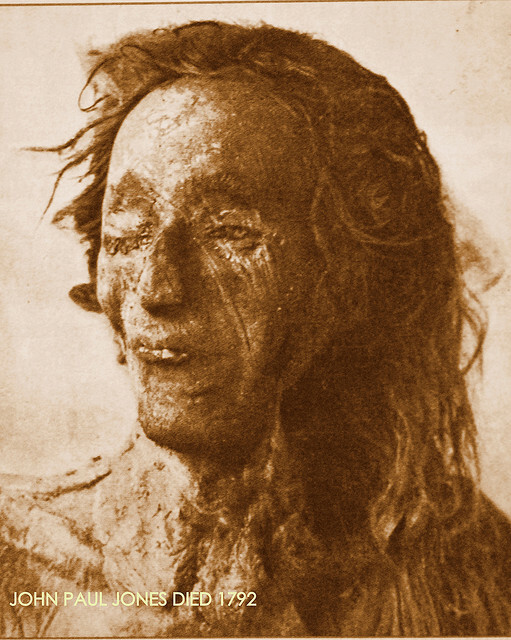 Tobacco staining on the teeth indicated that he might have smoked cigars and chewed tobacco. No pipe facets that were related to pipe smoking were evident on the teeth. Further study of the skeletal remains showed the kind of bone growth and fusing of bone that confirmed his age. The remains discovered in the AA section of the Hunley belonged to a Caucasian male whose bone age was between 24 to 25 years. The femur histology was 28 years. Dr. Owsley's notes reference the "medial epiphyses [ossification] of the clavicles [collarbone] are in the final stage of union and the hyoid [complex of bones at the base of the tongue] is intact with the wings fused to the body". Owsley found evidence that AA had health problems. According to his records, the "nasal septum is markedly deviated to the right side. This degree of deformity would have impaired airflow through the right half of the nasal chamber." This man's teeth were stained slightly from tobacco and there are no indications of pipe smoking. He had cavities and abscesses. Teeth near the abscesses were probably extracted. Six lower jaw teeth had a total of eight cavities.AA had five gold fillings and one filling made from a silver amalgam. The teeth had file marks in the enamel where the fillings were embedded. Different techniques in the manufacture and placement of the fillings could signify that more than one dentist repaired the teeth. Upon further examination of the remains, Dr. Owsley discovered an injury that revealed the identity of the victim. Owsley's notes say: "This injury was caused by a gunshot wound to the upper thigh, which was primarily a soft tissue injury that caused only superficial damage to the bone. The bone did not fracture and there is no evidence of a serious infection." A radiograph of the proximal half of the left femur revealed "lead spatter, small metallic particles." They were lead from a bullet and gold from a coin. AA was Lt. George E. Dixon, of Co. E, 21st Alabama Volunteers, who had volunteered to command the H.L. Hunley. He had been wounded at the Battle of Shiloh. The location, date, his initials and the words, "My life preserver," were engraved on the $20 gold piece that deflected the bullet. He carried the coin with him and it was found in the Hunley sediment. Linda Abrams identifies POW-MIA remains from the overseas recovery of casualties of World War II, the Korean War, Vietnam and subsequent battles for all branches of the military. About three years ago, Dr. Robert Neyland, project manager for the recovery and excavation of the Hunley, invited Abrams to identify the remains of the Hunley's crew through researching military records and by analyzing the DNA. Neyland was familiar with the POW-MIA office of the Pentagon. He needed someone with Abrams' solid track record. She has worked with more than 800 cases over 14 years and has identified all the remains. Abrams says she decided to accept the challenge although she was unfamiliar with Confederate Civil War history. She wanted to approach this research in a way no one had done before. She compared the investigation of the crews' remains and records to the investigation of a crime scene. Crime scenes are contained and evaluated before evidence can be tampered with. Witnesses are interviewed immediately after the incident before they can be influenced by media reports. When Abrams began to research the Hunley crew, she found that the trail of information had been affected by preconceived theories that were not substantiated by hard evidence. Her research with the National Archives on Confederate military records was based on 3 by 5-inch index cards, all that was left of the original records which had been destroyed. Full names were missing, places of enlistment weren't listed, although some military transfers were inscribed. It was incomplete information at best. Abrams went through 120 Confederate ship rosters. She spent hours searching for existing records obtained from various archives, probate courts, funeral homes and libraries throughout the country. She says she encountered staffers at some institutions who were woefully ignorant about the Hunley crew's significance and were reluctant to give their support. She also found others who couldn't do enough for her. Abrams became acquainted with crew descendents who were unaware of their ancestor's place in history and were grateful to learn about it. Historians were not entirely sure who the last crewmembers aboard the Hunley were. Obtaining permission from families whose ancestors probably served aboard the Hunley to exhume a known relative's grave takes patience and persistence. Also, it is very vital that any DNA extracted this way must come from the maternal line of the family to be considered reliable. The crew of the Hunley was comprised of soldiers and sailors who volunteered for the mission. Some of the crew was from Europe. At least two of the men were nearly or over 40 years old. One was identified as James A. Wicks, married with two daughters. He had deserted the U.S. Navy by jumping ship from the USS Congress and swimming to shore. Shortly afterward, he enlisted in the Confederate Navy in Richmond. An artilleryman, J.F. Carlsen, 20 to 23 years old and European, possibly Scandinavian, enlisted with Co. A, Light Artillery South Carolina Volunteers, also known as the German Artillery, before he volunteered to become the very last crewmember aboard the Hunley before its fateful voyage. The man in charge, Lt. George E. Dixon, had been a riverboat engineer on the Mississippi. He had enlisted in the Confederate Army as a private and rose through the ranks quickly. Abrams found records of two male friends of Dixon who had named their sons George. Dixon was described as handsome, "quite the fellow" from some sources. According to Abrams, "Dixon had the right stuff." She hopes to find more information on him. "He must have been an exceptional person," she says. Abrams admits that the research and analysis required to identify the Hunley's last crew is more daunting than her work identifying the remains of contemporary POW-MIAs. She has faced their skulls almost pleading for them to "talk to me!" Although the eight men will be laid to rest after 136 years submerged in the H.L. Hunley, the work in uncovering the secrets of their life and death will continue. The crew was composed of Lieutenant George E. Dixon (Commander), Frank Collins, Joseph F. Ridgaway, James A. Wicks, Arnold Becker, Corporal C. F. Carlsen, C. Lumpkin, and Augstus Miller. Apart from the commander of the submarine, Lieutenant George E. Dixon, the identities of the volunteer crewmen of the Hunley had long remained a mystery. Douglas Owsley, a physical anthropologist working for the Smithsonian Institution's National Museum of Natural History, examined the remains and determined that four of the men were American born, while the four others were European born, based on the chemical signatures left on the men's teeth and bones by the predominant components of their diet. Four of the men had eaten plenty of maize, an American diet, while the remainder ate mostly wheat and rye, a mainly European one. By examining Civil War records and conducting DNA testing with possible relatives, forensic genealogist Linda Abrams was able to identify the remains of Dixon and the three other Americans: Frank G. Collins of Fredericksburg, Va., Joseph Ridgaway, and James A. Wicks. Identifying the European crewmen has been more problematic, but was apparently solved in late 2004. The position of the remains indicated that the men died at their stations and were not trying to escape from the sinking submarine. On April 17, 2004 the remains of the crew were laid to rest at Magnolia Cemetery in Charleston, South Carolina. Tens of thousands of people attended including some 6,000 reenactors and 4,000 civilians wearing period clothing. Color guards from all five branches of the U.S. armed forces—wearing modern uniforms—were also in the procession. Even though only two of the crew were from Confederate States all were buried with full Confederate honors including being buried with a version of the Confederate national flag. Another surprise occurred in 2002, when a researcher examining the area close to Lieutenant Dixon found a misshapen $20 gold piece, minted in 1860, with the inscription "Shiloh April 6, 1862 My life Preserver G. E. D." and a forensic anthropologist found a healed injury to Lt. Dixon's hip bone. The findings matched a legend, passed down in the family, that Dixon's sweetheart, Queenie Bennett, had given him the coin to protect him. Dixon had the coin with him at the Battle of Shiloh, where he was wounded in the thigh on April 6, 1862. The bullet struck the coin in his pocket, saving his leg and possibly his life. He had the gold coin engraved and carried it as a lucky charm. The National Underwater and Marine Agency (NUMA), originally an organization within the fiction of author Clive Cussler, is a private non-profit organization in the United States. Cussler created and leads the actual organization which is dedicated to "preserving maritime heritage through the discovery, archaeological survey and conservation of shipwreck artifacts." If the men of the Intrepid had been killed in a helicopter crash in the mountains of Laos or Camboda, whenever it happened and however remote and inaccessible their bodies were located, they would be home now. When we started the most recent effort to repatriate the remains of Richard Somers and the US Navy heroes from Tripoli all we asked was that they be treated like any other US serviceman who is killed in action and returned home. The process is already established and the POW/MP office has quietly repatriated the remains of thousands of US servicemen who have been killed in combat in from World War II, Korea, Vietnam, Iraq and Afghanistan. 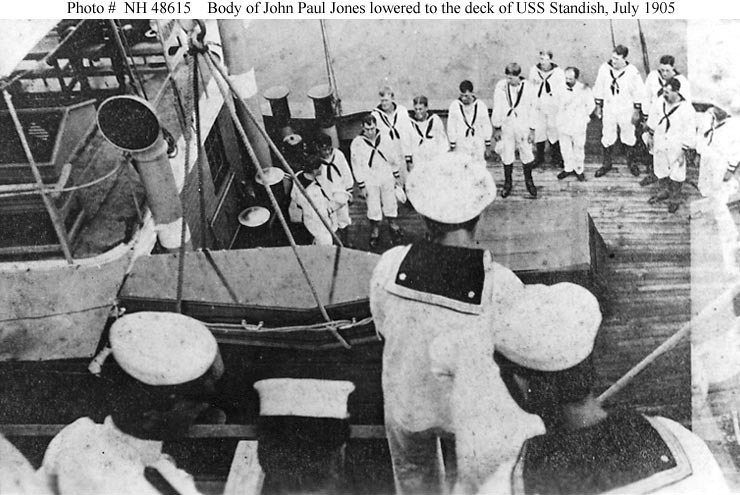 The US military runs on policies however, and one of those policies is that they only apply the “leave no one behind” tradition to those killed since World War I, even though there have been exceptions, such as the repatriation of the remains of John Paul Jones from Paris. When a US serviceman is killed or dies abroad, their remains are taken to American military bases in Hawaii or Germany where they are given a full forensic autopsy before being flown to Dover Air Force Base in Delaware, where they are either handed over to the family or buried at Arlingtion or a veterans cemetery with full military honors. Both Dover AFB and Arlington National Cemetery have been subjects of recent scandals, Dover involving the disposal of the partial remains of some of the dead in a landfill dump, while discrepancies have been found in nearly one quarter of the 300,000 graves at Arlingtion. Although the officers responsible have been reassigned, “new leadership” teams have been put in place, the partial remains now disposed of at sea and Arlington has upgraded their record keeping policies, these incidents have called attention to both Dover and Arlingiton and the policies and practices that are undertaken in the burial of those killed in action. Not unknown to scandal, Dover was also where two nuclear bombs went missing, bombs that were intentionally disposed of in the ocean off of Cape May, New Jersey, and never recovered. During the Iraq war President George Bush ordered that the press and photographers be banned from Dover AFB so photos of the dead would not be used to encourage anti-war sentiment, though that rule has been relaxed so the families can now choose whether or not they want photographs or reporters. The American attitude towards the return of the remains of their war dead is much different than that of Canada, where they hold what is known as a “Ramp Ceremony” whenever the casket of a dead service member is returned home. Everyone in the area stops what they are doing and salutes the remains as it is taken off the plane and transported from the ramp. While the United States has a similar ceremony, it is not conducive if the public, the press and photographers are banned from the area and forbidden to photograph the event. 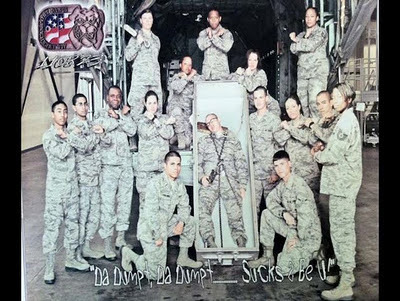 More recently a photo has been posted on the internet that appears to indicate some of the service members who were stationed at Dover didn’t take their jobs very seriously, though the origins and meaning of the photo has yet to be properly explained. In 2007, the military secretly repatriated the remains of 70 Americans from the cemetery at Wheelus Air Force Base in Tripoli, without identifying or notifying the families involved. Only after all of the remains were in Dover was there an attempt to locate and notify the families of those exhumed, and there is no indication of what became of the remains of those who were not identified. Were they reburied at a military cemetery in Delaware or did they end up with the partial remains and dumped at the local landfill? And why weren’t the 13 men of the Intrepid included in the mass exhumation and transport of the remains of 70 Americans from Tripoli when the opportunity presented itself? How the military deals with its dead, especially those who die in combat, is now the subject of three reports – the Dover AF photo investigation, the Arlington burial scandal and the House/Senate Armed Services Committee Conference evaluation of the Tripoli graves. Will the military assigned to do these reports sweep the dust of our heroes under the rug and whitewash the truth, or will they do the right thing and apply their policies across the board to all servicemen, regardless of when they served? Will they leave the remains of our naval heroes buried in an unmarked grave under a parking lot at Martyrs Square, or return them home with dignity and bury them with honor and respect? (ANSAmed) - TRIPOLI, NOVEMBER 2 - The Bishop of Tripoli, Mons. Martinelli, celebrated today in the presence of Italian Ambassador Francesco Paolo Trupiano and numerous representatives of the Italian community the traditional mass for commemoration of the dead, served at the altar which towers above the crypt where Italo Balbo was buried in the Italian cemetery in the Libyan capital. The Hammangi Cemetery, where the remains of at least 8,600 compatriots rest, and defined for years as the "cemetery of shame" or "the forgotten cemetery", is recovering little by little its dignity thanks to a recovery project launched in July 2006. For years the Hammangi Cemetery has been a real outdoor dump, profaned by unknown hands which have uprooted the crosses, broken the stones, rummaged tombs searching for some gold chains, or just for the pleasure to profane. A grievous, dramatic picture which accommodated the first of 20,000 Italian refugees in Libya pursued in 1970 by Colonel Gaddafi, who in November 2004 received a permission to return in Tripoli and faced a real slaughter. The International Management Group (IMG), an international body which has been entrusted with the environmental recovery intervention - funded by MAE - of the entire cemetery designed by architect Paolo Caccia Dominioni, has just completed the works on the exhumation of 6,472 bodies, of which 3,730 have already been placed in new urns and the others are kept for now in a underground crypt of a military shrine, which has kept for years the remains of 11,000 soldiers who died during the colonial war, awaiting their transfer into new urns, once the works are finished. Only 23 bodies remain for exhumation, which will be transferred in Italy, once the necessary procedures completed. The works on the recovery of the whole area within the perimeter fence continue, the Libyan authorities will be charged with the incinerator used to burn some 5,000 old wooden coffins and clothings of the exhumed bodies, as well as with the iron coffins. Now the third phase of the project remains which, according to the commitments taken on at the time by the authorities in Tripoli, envisages among other things the recovery of the outer large square and the construction of a new road to access the main road. The whole area surrounding the new perimeter, some 12 hectares, will be returned to the municipality of Tripoli, which will create a green area there. "I expect that it will be no longer described as the cemetery of shame," Giovanna Ortu, president of the association of Italians repatriated from Libya (AIRL), which took part in the 'travel of memory' in November 2004, said. The hope is fulfilled also thanks to the patient work of the guardian angel of the Italians in Libya buried in Hammangi, Bruno Dalmasso, who was in charge of the diggings to exhume the bodies and identified them one by one. Thanks to his constancy and to that of the Italian Consulate at least 95% of these dead now have names.(ANSAmed). Tripoli, Libya, April 3, 2011..El Hammangi cemetery. A lone dog wanders around a broken statue in the italian part of the cemetery, rebuilt in 1951 by Caccio Domignioni. The remains of 54 Americans were laid to rest in a solemn ceremony at the Delaware Veterans Memorial Cemetery in Millsboro Friday, after making a long journey from their initial resting place at a cemetery in Libya. The 52 infants and two adults were first interred at Hammangi Cemetery, an Italian cemetery located in Tripoli, Libya, between 1956 and 1970, when the U.S. military operated Wheelus Air Base there. "Family members of Airmen were often buried in the cemetery because, at that time, service members did not receive entitlements to have the remains of their loved ones flown back to the U.S. for burial," said Mark Blair, chief of Air Force Mortuary Affairs. Not long before major renovations were set to begin at Hammangi Cemetery, U.S. government officials were told that the graves of the American military dependents would be disturbed and that the plans for the new cemetery area did not include a burial site for those remains. In coordination with the U.S. State Department, an Air Force Services Mortuary Team, led by Mr. Blair, went to Libya and exhumed the remains, taking great care to maintain the individual identity of each set of remains throughout the process. The team brought the remains to the Charles C. Carson Center for Mortuary Affairs at Dover Air Force Base, where they were held while officials exhausted all efforts to contact the families to make final disposition arrangements. In total, 72 American citizens were repatriated this spring. Of the 72 remains that were repatriated, however, the families of 18 of them chose to have their loved ones interred in various locations. This left 54 individuals without a final resting place on American soil. Because of the amount of time that had transpired between the original internment and repatriation of the bodies, Air Force officials were unable to make contact with every family. It was through a close working relationship between the Air Force, Delaware state officials and the Delaware Commission of Veterans Affairs that the remaining bodies could be interred in the cemetery at Millsboro. "I am very honored that the Delaware Veterans Memorial Cemetery is the final resting place for these Americans," said Delaware Secretary of State Harriet Smith Windsor, who attended the ceremony. "Today is the culmination of a lot of hard work and coordination, especially on the part of Tony Davila, Executive Director of the Delaware Commission of Veterans Affairs, and the Air Force." Among those present at the ceremony were Chaplain (Lt. Col.) Ronald Harvell, Chaplain (Capt.) Robert Roffman, and Father Michael Darcy, who provided Protestant, Jewish and Catholic prayers, respectively, providing for the particular religious needs for the internment of each of the 54 repatriated Americans. Kaiserslautern, Germany - The Air Force is looking for the families of 72 deceased Americans repatriated near a former American military base in Libya. In a surprising display of how relations between the U.S. and Libya have warmed, American military cargo planes were allowed to land in the country last March to transport the remains to Dover Air Force Base, Delaware. The American dead are believed to be family members of airmen once stationed at Wheelus Air Base, home to B-52 bombers from 1958 to 1972. The remains, some of them nearly fifty years old, include 70 infants and two adults. Plans to reduce the size of the cemetery prompted the transfer. Air Force officials did not release information on the repatriation until now due to the State Department's concern over the fragile, yet improving relationship between the two countries. The military has set up a hotline and has reached out to Wheelus High School alumni in hopes of tracking down family members. 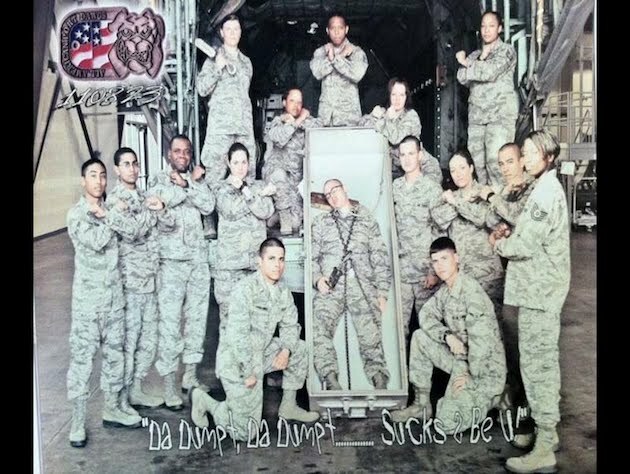 Air Force Mortuary Affairs officials declined to be interviewed for this story and would only answer questions by e-mail. The U.S. embassy in Tripoli did not return phone calls or e-mails. "While some families have been located and notified, this is an enormous task considering the limited information that we have available to work with," the air Forces Mortuary Affairs office wrote in an e-mail to Stars and Stripes. "Since all of the cemetery records were handwritten with only limited information recorded, it will take some time to ensure we locate the next-of-kin." Wheelus, which was located just east of Tripoli on the Mediterranean coast, served as a U.S. Air Force base until Moammar Gadhafi ousted the king in 1969. The Italian military used to run the cemetery and offered free plots to Americans stationed at Wheelus when the Air Force used the base. A team of three mortuary affairs specialists accompanied by a financial specialist spent two weeks in February recovering the remains with the help of locally contracted workers. A C-130 transport plane assigned to the 86th Airlift Wing's 37th Airlift Squadron flew the dead to Ramstein Air Base, where they were transferred to a C-5 cargo plane and sent to Dover. "The mission to recover U.S. remains from the cemetery in Libya was absolutely the right thing to do, and the 86th Airlift Wing was proud to have a role," Brig. Gen. Richard Johnston, the 86th commander, said in a written statement to Stars and Stripes. "The government of Libya was very helpful in facilitating this humanitarian effort, and we appreciate their cooperation which allowed the United States to make that happen." The remains will remain at Dover Air Force Base until family members can be contacted. If the families cannot be contacted, the military will bury them at a federal or state cemetery near the air base, the Air Force said. Relations between the U.S. and Libya have been confrontational for a span of nearly three decades up until several years ago. The U.S. government restored diplomatic relations to Libya last year after the North African country renounced its support of terrorism and agreed to give up its weapons of mass destruction. I have attached a complete listing of remains repatriated from the Hammangi Cemetery in Tripoli, Libya in March of 2007. Our office utilized multiple angles to locate and contact surviving next of kin including genealogical research, National Archives, Air Force Historical Research Agency Archives, Wheelus High School Alumni Association and the former Tripoli Residents Association. Those remains claimed by surviving family members were processed by members of our staff, provided a specification casket, and interred according to the families instructions. A member of our staff and a uniformed Air Force member was present at each interment with the family's permission. Those remains that were unclaimed or in which no surviving next-of-kin were located were processed by members of our staff, provided a specification casket, and provided a dignified interment with an ecumenical graveside service at the Delaware Veterans Memorial Cemetery in Millsboro, DE. Of the original 72 remains recovered, 18 were claimed by family members. Due to privacy concerns for those families, we would ask that you do not publicly post the fathers' names. Although many years have passed, such a loss remains very sensitive to many of these families. I have transcribed the names and dates of death from Randy Keel's original spreadsheet. Except where noted, burial was one to three days after death. For each burial, the spreadsheet also provides the father's name. Occasionally there was some additional information, such as the name of the officiating clergyman or the morgue technician. The original records are handwritten logs. Tripoli, Libya, April 3, 2011..El Hammangi cemetery. More than 4500 commonwealth fighters from WWII are buried in the British Cemetery, beautifully maintained by the British embassy in Tripoli. Tripoli, Libya, April 3, 2011..El Hammangi cemetery. Hundreds of non muslem foreigners, mostly African migrant workers, are buried in a remote part of the cemetery. Tripoli, Libya, April 3, 2011..El Hammangi cemetery. Hundreds of illegal would be immigrants to Europe are washed away on the Libyan coast when their frail boats capsize during the perilous trip to Italy; many of those often unidentfied bodies are buried in a remote section of Hammangi old cemetery in Tripoli. Sen. John McCain blocks return of the body of Richard Somers, namesake of Somers Point. 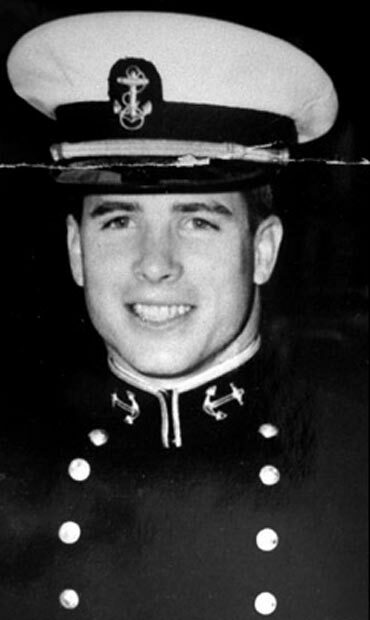 Former Navy pilot and prisoner of war, McCain did the biding of the US Navy brass when he squashed a Senate amendment to the 2012 National Defense Act to repatriate the remains of Navy heroes who were trying to free the American prisoners of war held in the dungeons of the old castle fort in Tripoli. The prisoners buried the remains of Richard Somers and the other officers and men of the Intrepid on the beach near the harbor. Posted: Friday, December 23, 2011 6:28 pm | Updated: 7:53 pm, Fri Dec 23, 2011. SOMERS POINT — Master Commandant Richard Somers will have to wait a little longer to come home, if it happens at all. Efforts to repatriate the remains of the city’s namesake and U.S. Naval hero — killed with his crew aboard the USS Intrepid in 1804 in Tripoli Harbor during the First Barbary War — date to the 1840s. Spurred by this year's political upheaval in Libya, the movement seemed to finally have the congressional backing it needed to order the Department of Defense to take action regarding the return of the bodies of Somers and his men to the U.S. However, the language in an amendment to the 2012 Defense Authorization bill that ordered the return of the bodies was changed at the last minute in favor of a diluted order for the issue to be further evaluated. And this was done, supporters of the measure say, at the request of Sen. John McCain, R-Ariz., a former Navy prisoner of war. 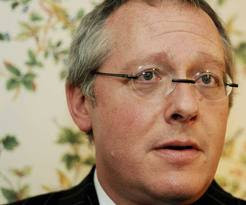 “But our Constitution is set up for Congress to be independent of the executive branch, so he took it upon himself to make this decision,” Caputo said. The abrupt turnaround was a blow for Somers Point officials, who thought they would soon be celebrating the return of the man the city honors with a Richard Somers Day celebration every year. 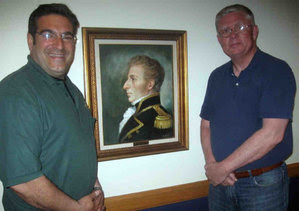 Greg Sykora (left) and Mayor Jack Glasser (right) with portrait of Richard Somers at Somers Point NJ City Hall Council Chambers. The Press of Atlantic City contacted McCain’s office in Washington, D.C., for an explanation of his position on the repatriation of the Intrepid crew. “Sen. McCain continues to evaluate the issue, and looks forward to gaining the input and recommendations of the Secretary of Defense and the Navy,” Brian Rogers, McCain’s communications director, wrote in an email. However, groups such as the American Legion, Veterans of Foreign Wars, and the American Battle Monuments Commission — which manages America’s overseas cemeteries and memorials, including the American cemetery in Normandy, France — have expressed support for the cause. Under the new language of the bill, the secretary of defense and the secretary of the Navy have 270 days after the bill is enacted to conduct an evaluation into the feasibility of recovering the remains. But Caputo said he does not expect the study to have a positive outcome. Caputo said apparent proof of the “whitewash” was evident when the cemetery was allegedly given a quick makeover prior to Defense Secretary Leon Panetta’s Dec. 17 visit to Libya. 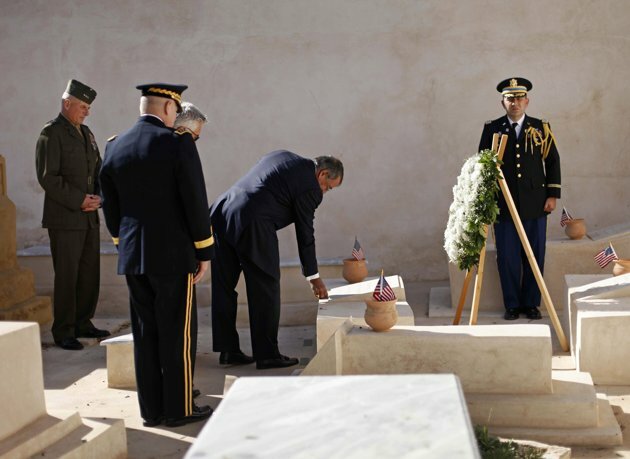 Defense Secretary Pinetta places Challenge Coin on an Intrepid grave at the Tripoli cemetery. One of the angles Caputo said his organization plans to pursue is contacting Arizona voters. But Caputo admits that time is running short. 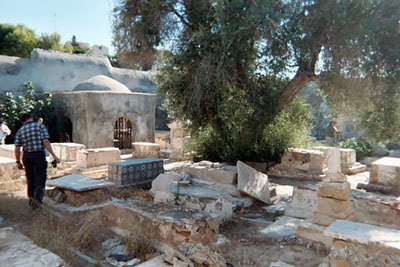 Old Protestant Cemetery before the facelift. The remains of more than half of those buried in the cemetery have been relocated to more secure and permanent locations. Sen. John McCain’s reluctance to back efforts to return the remains of some of the Navy’s first fallen heroes from the shores of Tripoli is nothing short of puzzling. Given his own heroic service to this country, we can only believe him when he says he just needs more information and opinion from the Navy, the Defense POW/MIA Office and the Joint POW/MIA Accounting Command. But we disagree with the senator’s recent action that has delayed the repatriation of the remains of the sailors 207 years after their deaths. McCain blocked an amendment in the Senate that would have forced the Pentagon to retrieve the remains of the crew of the USS Intrepid, which was sailing against a pirate fleet in what is now Libya during the First Barbary War in 1804. Intrepid was filled with explosives and its 13-man crew was sailing for Tripoli harbor, which was a base for pirate ships that were pillaging American merchant vessels in the Mediterranean. The sailors planned to set fuses and escape before Intrepid exploded in the middle of the pirate fleet, but the vessel exploded prematurely, killing all on board. The Navy has declined to retrieve the remains, determining that Libya is the “final resting place” of the sailors, and that Navy custom calls for honoring the final resting place of those lost on ships and downed aircraft. A formal memorial ceremony held in honor of the sailors and crew took place in Tripoli in 1949, and the Navy has said that U.S. Embassy personnel conducted regular services there for decades. However, descendants and those with a keen interest in rectifying what they believe to be an oversight want the remains of these sailors returned. Michael R. Caputo, a longtime political operative from East Aurora, has put his skills to good work on this cause since 2005, enlisting the help of David Bellavia, an Iraq War hero from Batavia, on what is known as the Intrepid Project. The two have joined a grass-roots effort at repatriation. Caputo makes an undeniable point that the sailors are not honored where they are, in Libya, which until recently was ruled by anti-American despot Moammar Gadhafi. Rep. Mike Rogers, a Michigan Republican, took the trouble to vis-it the sailors’ graves in 2004 and was appalled at the condition. He took over as House Intelligence Committee chairman and pushed legislation requiring the Pentagon to return the sailors’ remains to U.S. soil. Caputo worked hard to get support for the effort and did so, from the American Legion and the Veterans of Foreign Wars, not to mention other legislators. The Rogers measure passed the House in late May. Then the support building in the Senate was dashed by McCain. Now it’s up to a House- Senate conference committee, where the senator has great influence. To suggest that leaving the remains of these heroes in Libya is acceptable would be an injustice to their descendants, the American people and the country for which they gave their lives. The senator should support this repatriation. “Mr. President, I come to the floor today to discuss the Fiscal Year 2012 Omnibus Appropriations bill that the House just passed this afternoon and the Senate will vote on tomorrow. Once again, the Senate is faced with a thousand-plus page behemoth of an appropriations bill and very little in the way of authorizations to support it. So here we are, at the end of another calendar year, cramming what should be months of actual debate and legislating into hours of reckless appropriating. “Exactly one year ago, I was here on the Senate floor discussing the exact same problem in the Senate. We were debating an omnibus appropriations bill that was 1,924 pages long and contained the funding for all 12 of the annual appropriations bills for a grand total of over $1.1 trillion and contained approximately 6,488 earmarks totaling nearly $8.3 billion. At the time, I also expressed my frustration at the fact that the Senate refused to move appropriations bill in regular order by debating them one by one, and how it is shameful and we should be embarrassed by the fact that we care so little about doing the people’s business that we continuously put off fulfilling our constitutional responsibilities until the very last minute. While, thankfully, that pork-laden FY2011 Omnibus never became law, we are back at it again this year. “This time, the conference report we have before us is 1,221 pages long and contains funding for nine of the annual appropriations bills for a grand total of $915 billion (that figure rises to $1.043 trillion if you include the three appropriations bills that have already been enacted). • “Last year – 1,924 pages. This year – 1,221 pages. • “Last year – all 12 annual appropriations bills. This year – nine of the annual appropriations bills. • “Last year – over $1.1 trillion in spending. This year – over $915 billion in spending or $1.043 trillion if you include the three bills we’ve already passed. That works out to be a reduction of 5% from last year to this year. Taxpayers get a better deal at a Macy’s Christmas sale. • “Last year – 6,488 earmarks totaling nearly $8.3 billion. This year – no traditional “earmarks” but over $3.5 billion in unauthorized spending in DoD alone. “So should we consider this progress? Are we doing anything differently? The national debt is now at the record level of over $15 trillion, which is more than $48,000 per citizen, yet we have failed to make any significant, meaningful spending cuts and we continue with business as usual. “Mr. President, the rush to beat the clock and avert a government shut-down is the fault of Congress. It has been four months since we passed the Budget Control Act, which is more than ample time to consider the appropriations measures and more importantly debate and offer amendments on issues that we feel are important to the American taxpayer. We should have the opportunity to offer amendments to cut wasteful spending and eliminate duplicative programs, however, we are now being forced to trust a handful of Senate and House Appropriators to make spending decisions for the rest of us. This is unacceptable in my opinion and I believe it is unacceptable to the American people. “I wish we could say we didn’t see this coming. The fact is we did see it coming, as early as this spring. In keeping with the regular order and the legislating requirements of the Senate, the Armed Services Committee scheduled and conducted more than 70 hearings, vetted the President’s 2012 budget request, and reported a bill out of committee. Seven months later, we were given time by the Majority Leader to amend and pass the bill on the floor. The other authorizing committees weren’t so lucky. So I say again, here we are, facing an omnibus appropriations measure that lacks properly authorized funding. What is more maddening is that even in the cases where the Senate did authorize funding – as in Defense – the appropriators nonetheless included unrequested and unauthorized spending. “We have a fundamental problem in the Senate, Mr. President, of being unable to engage in the process of authorizing prior to regular appropriations. And what is the outcome? A handful of appropriators and unelected staffs disburse hundreds of billions of dollars, often in a manner that directly contravenes the will of the authorizers. Consequently, at the 11th hour of the process, we ram through an omnibus measure so that we can get out of town for the holidays. It’s disgraceful Mr. President. “I strongly oppose Section 8083 of the Defense portion of the bill which permits the Secretary of Defense to transfer Defense operation and maintenance funds totaling $33 million to other federal agencies. This is an earmark to Guam, make no mistake about it, and this funding is included in the bill in direct contravention of explicit direction to the contrary in the Conference Report on the FY12 National Defense Authorization Act which passed this chamber on a vote of 86-13 last night. As such, if this Omnibus Appropriations bill was subject to amendment, I would immediately seek to strip this funding from the bill. “Let me be clear about what this controversy between the Defense Authorizing and Defense Appropriations Committees is about. This funding is an absolute earmark for Guam and qualifies by any interpretation as a ‘bridge to nowhere’ in terms of whether it supports any currently on-going activities of the Department of Defense. “The money is, in part, to provide the Government of Guam funds to buy 53 civilian school buses and 53 repair kits for the buses for $10.7 million. Let’s stop there. Why in the world is the Department of Defense buying school buses for anybody? Has one single Marine, sailor, or airman been assigned to Guam as part of the intended buildup that would justify using DoD money to ease a strain on Guam’s school systems? The answer is a flat ‘no’ – this is a pork-barrel payoff to Guam to solve an already existing problem that has nothing to do with any future military realignment related to Guam. “What else are we buying for this $33 million? Well, $12.7 million is intended to be used for a ‘cultural artifacts repository’ which advocates of this pork-barrel extravaganza claim is related to artifacts that will be dug up during the major military construction projects that have been planned for Guam as part of the buildup. There’s only one problem with that argument: it is flatly not true. First, the military construction projects that would unearth new artifacts for this facility have been put on hold for at least FY2012 and probably longer until the Department of Defense provides Congress with an overall plan and estimated cost for the entire Guam buildup project, and an outside, independent study is prepared and reported to Congress that assesses our military force structure needs in the Pacific. So, the money intended for this ‘cultural artifacts repository’ is, at best, early to need during FY2012 and most likely won’t be known until after completion of another environmental study in two years. If the decision is made not to conduct the sort of extensive military construction projects and training ranges on Guam needed to sustain the movement and permanent basing on Guam of 8,700 Marines and their families – now estimated to be an investment of at least $20 billion – this ‘cultural artifacts repository’ is truly a ‘bridge to nowhere’ because the artifacts it is intended to hold will never be dug out of the earth. The perversity of the logic that we build a museum for artifacts that may never be unearthed is striking. “But wait, is that the real story? Well, of course not! The money in this Defense Appropriations bill for the ‘cultural artifacts repository’ is actually going to be spent to build a 20,000 square foot ‘museum’ – most of which will be used for the storage of existing artifacts and existing administration completely unrelated to the major military construction projects associated with the build-up on Guam. Guam has been seeking federal funding for this facility for years without success, but because there is some hope of a military buildup on Guam in some form, they have used that weak reed to try to support an argument that somehow this museum relates to the military construction projects – which in any event won’t happen for years into the future. So, at a time of severe fiscal constraint for the Department of Defense, and when every American is being forced to tighten their belt and spend only on the essentials, Guam – through the good offices of their protectors on the Senate and House Appropriations Committees – gets the benefit of $12.5 million in Federal largess for a new museum which they otherwise could not afford. I can only say that the many citizens of Arizona who are out of work, whose homes have been lost due to the economic downturn, who would benefit from any sort of action by the Federal Government to create jobs and ease their burdens, feel nothing but outrage when they see this kind of blatant waste and abuse of the political system that has gone on for years and years and years. “But that’s not the end of this sad story. Within this initial funding grant to Guam of $33 million is $9.6 million for the first phase of a mental health facility that advocates claim is somehow related to the proposed military buildup on Guam. I’m still trying to sort this argument out, but I have that odd feeling that to do so I must go down the rabbit hole to Alice in Wonderland. Without one additional Marine or their family being stationed on Guam, how does a proposed buildup that will not come until years in the future relate to the adequacy of mental health facilities on Guam now? “Well, I’m glad that question came up, because it might not surprise you to learn that this money for a new mental health facility has nothing to do with any Marines coming to Guam now or in the future, but is instead required to satisfy a current federal injunction that mandates the construction of a new facility. And, of course, this $9.6 million dollars of pork in the FY12 Defense Appropriations bill is only the down payment, the ‘nose of the camel under the tent’ you might say, because to complete the facility as required to satisfy the already existing federal injunction against Guam, another $33 million will be required next year in 2013 to finish out the project as well as building a new public health laboratory. Wonderful! The Department of Defense will have invested nearly $43 million dollars in a brand-spanking new mental health facility and a public health laboratory before one new Marine or their family ever touches soil on Guam. And, of course, if Congress decides that the U.S. taxpayer cannot afford to spend $20 billion or more for a permanent and extensive force posture buildup on Guam, at least Guam will have gotten a $43 million dollar payoff from the Defense Appropriators that gets Guam off the hook with their pending injunction. It sure is good to have friends in Washington, isn’t it? “Our committee did the research for these projects on Guam. We reviewed the working papers of the Department of Defense’s Economic Adjustment Committee, excerpts of which I ask unanimous consent be inserted into the record. We realized that this funding would not go to defense priorities and decided as a Conference not to support their authorizations. “As it should be clear by now, these expenditures, pushed through in direct contravention of the bipartisan, bicameral decisions of the Armed Services Committees of the Senate and the House of Representatives, are nothing more than a shameful, disgusting waste of taxpayers’ money and in my view a classic example of political abuse of the appropriations process. “This is not the way Congress is supposed to work. Authorizing committees exist to provide specific congressional approval of Federal spending. Appropriations committees and subcommittees exist to take the available Federal dollars and allocate them to programs consistent with the authorizations that have been provided by the authorizing committees. In no way do appropriations committees have the legitimate authority to override the specific direction of authorizing committees when those authorizing committees have spoken to a matter and denied authority for a specific type or level of funding. This is an extreme, but useful, example to show exactly why American voters are so fed up with Congress. This is exactly why the approval rating of Congress is in the single digits. The American people have seen this kind of abuse and waste for far too often, and they have had enough of it. They are convinced Congress never learns. And by this example, it’s hard to say they are wrong. In fact, this sort of complete waste and abuse of the taxpayers’ money proves they are exactly right. “If you don’t understand the rise of the Tea Party, you can start by looking right here. “And it is not as if this issue was somehow hidden from the leadership of the Appropriations Committee. I would like unanimous consent to insert into the record the letter I sent yesterday to Chairman Inouye and Vice Chairman Cochran of the Senate Appropriations Committee highlighting this exact issue and my concerns about it. No, this is not about ‘not knowing what was going on’ this is about ‘business as usual’ and it will cost every Member of this body and the chamber on the other side of the Capitol because voter outrage over this kind of waste of their money has never been higher. And I can’t blame them. Who could? “Another example of the broken appropriations process is demonstrated in this bill’s funding of the Medium Extended Air Defense System (MEADS). This program should have been terminated in FY12, as originally proposed in the Senate version of the Defense Authorization bill. Instead, the Defense Appropriations portion of the Omnibus funds MEADS at $390 million, nearly the entire $406 million requested for this year. “Upon learning that the Appropriators were going to fund this program – which Army leaders have told the Senate they do not intend to ever buy or deploy – I felt compelled to ensure that the final FY12 Defense Authorization Conference Report we adopted last night prohibits any MEADS appropriations beyond FY12. Under the requirements imposed by the Defense Authorization Conference Report, this year’s funding will be significantly restrained by prohibiting the Department from spending more than 25 percent until the Secretary of Defense provides a plan to either restructure the program in a way that requires no additional funding or terminates the program. This report from the Secretary must include a plan for ending the program for at least $400 million less and one year sooner than the President’s request. While this action would not have been necessary if the Appropriations committee had not ignored the unanimous direction of the Senate Armed Services Committee, I remain committed to holding Congress accountable to both our men and women in harm’s way and the American taxpayer. “Any decision to continue to fund troubled programs like MEADS are simply unacceptable at a time when we face unprecedented cuts in Defense spending. The Senate Armed Services Committee will give MEADS the highest level of scrutiny to ensure this program is ended on the terms set out in the Defense Authorization Conference Report. “The Appropriators also chose a different path than the Defense Authorizing Committees on the Next Generation Strategic Bomber. Instead of holding funding to the President’s Budget request, the Appropriators chose to add an additional $100 million dollars – more than was recently authorized in the National Defense Authorization Act. • “The Capabilities Requirement Document, which is key to ensuring that the new bomber design is stable – which is needed to determining if increased taxpayers’ dollars should be invested in the new bomber, is NOT complete and will NOT be complete for a couple of years – at best. • “Finally, the current B-52, B-1 and B-2 sustainment and modernization programs were cut by the Appropriations staff to help pay for this $100 million plus up for the Next-Generation Bomber. The Air Force told my staff this morning that they would prefer the money to go to help modernize legacy bomber programs, as the Air Force had requested, instead of going towards the Next-Generation Bomber. If this additional, unrequested funding is enacted, as it almost surely will be, we will almost certainly be dealing with this same $100 million again as the source for a reprogramming request by the Air Force to move the money back to where it is needed – for sustainment of the legacy bomber fleet. “Of the approximately 100 unrequested and unauthorized additions above the President’s Budget request found in the Defense Appropriations bill, one of the more concerning is a $20 million allocation for an obscure aircraft program called ‘Combat Dragon II.’ Although the name is interesting and sounds threatening enough – you won’t find it in the President’s Defense Budget request, nor did it appear in the Defense Authorization bill. So, again, I asked staff to pull the string on it and see what unraveled. “The purpose of the program is to lease up to four crop-duster-type aircraft and to outfit them with machine gun pods, laser-guided bombs, rockets and air-to-air missiles. So, I directed my staff to see if this alleged requirement was justified and properly vetted and approved within the Pentagon by a Joint Urgent Operational Needs Statement, since it was not in the Administration’s budget request. Once again the answer was a resounding ‘No’ – there is NO urgent operational requirement for this type of aircraft. So, why do we need it and why is it funded? “After turning over the right rocks, we found that this aircraft lease will not be competitively awarded – shades of the infamous tanker lease program – and as such is effectively earmarked for a particular aircraft manufacturer who has the corner on this particularly obscure part of the aviation market. This past summer ‘Aviation Week & Space Technology’ magazine wrote about a similar close air support aircraft program created by Lockheed Martin and Hawker Beechcraft. “The current close-air support workhorse-aircraft for the military is the A-10 Warthog. Over the past 5 years, the Air Force has spent hundreds of millions of dollars each year for the last five years upgrading and modernizing the A-10 by re-winging, adding additional navigational and communication gear, and improving weapon delivery systems. “During these austere budget times, can the taxpayers afford to waste taxpayers dollars on a duplicative close air support program without any clear, defined requirement? I don’t think so and nor does any independent military expert. “The Defense Appropriations bill also adds $225 million for an unrequested, unauthorized C-17 aircraft that no one in the Air Force or the Pentagon thought was needed in these tough fiscal times. “According to every strategic planning document, the Air Force has an excess capacity of large cargo aircraft. The Air Force already has 222 C-17 cargo aircraft and more than 80 C-5 cargo aircraft. The Air Force is striving to ‘right size’ the strategic airlift fleet in the most effective and efficient way to meet our nation’s strategic airlift requirement. The Defense Authorization Conference report, passed yesterday by both the House and Senate and sent to the President contains a provision to lower the floor of large cargo aircraft from 316 to 301 aircraft and includes funding to shut down the Boeing C-17 production line, NOT authorization to build another aircraft. “The key reason for an overage of large cargo aircraft is because the Appropriations Committees over the past several years added 44 C-17s that were not authorized and that we neither needed nor could afford, at a total cost of over $14 billion above the Department’s requests – in the form of earmarks. “The Office of Management and Budget, five Secretaries of Defense, the current Commander of Transportation Command, the current Secretary of the Air Force, the current Chief Staff of the Air Force, and the current Commander of Air Mobility Command, have unanimously stated they do not need, nor can they afford to operate any more C-17 aircraft. In fact, the President appealed to the Congress that the Nation cannot afford any more C-17 cargo aircraft. You would think that after $14 billion dollars and 44 C-17s averaging over $250 million each would be enough of an earmark – not so for the Appropriations Committees. “Mr. President, while the Department of Defense struggles to find more than $450 billion in cuts directed by the President, the Appropriations Committee continues to conduct business as usual by rewarding special interests and funding pet projects with vague objectives and limited or no utility to the Department. The Defense portion of the Omnibus contains some $3.5 billion in unrequested, unauthorized spending for items that are not core, high-priority Defense requirements. As you will see, Mr. President, many old favorites appear on the list. • “We’ll start with the Air Force – $25 million for unrequested helicopter upgrades. • “An increase to the Civil Air Patrol program of $7 million – unrequested and unauthorized. We are left to assume that the Air Force Auxiliary is a higher priority than the hundreds of programs which took budget cuts this year. • “$273 million in unrequested, unauthorized Army research on everything from Parkinson’s disease and HIV to alternative energy and nanotechnology. • “Speaking of alternate energy, the Appropriators tucked unrequested, unauthorized funding throughout Division A of the bill. $130 million in ambiguously named ‘alternative energy research’ is scattered for the same sorts of programs that brought us the recent achievement of the Department of Navy, which proudly announced the purchase of 450,000 gallons of alternative fuels for $12 million. This equates to over 26 dollars per gallon. No wonder the Department of the Navy needs more money in 2012 for higher fuel costs. • “$262 million in unauthorized Navy research and development programs. The list of Navy adds is eerily similar to the Army’s, and as you would expect, Mr. President, it covers a familiar set of member interest items … nanotechnology, alternative energy, and giveaways to home state interests. • “The bill includes $50 million in increases for ‘Space Situational Awareness’ in two separate funding lines with no accompanying justification. These unrequested adds are so vague that I am sure that Members will be calling into the Pentagon to be sure that the money goes where they intended. This is a sad, old game being played over and over again. • “The budget requested $86 million for Operationally Responsive Space. This bill adds $25 million more, just for fun. The appropriators may have convinced themselves otherwise, but an additional $25 million will not solve our systemic space acquisition problems. • “Mr. President, the Armed Services Committee authorized, and the Congress will soon appropriate, some $290 million for research into post-traumatic stress disorder, prosthetics, blast injury, and psychological health. These are critical to improving actual battlefield medicine. Yet once again, the appropriators inserted unrequested funding for medical research, this time to the tune of $600 million. Let me remind my colleagues that these unrequested projects are funded at the expense of other military priorities. While I agree that research on multiple sclerosis, Alzheimer’s and cancer is meritorious, I restate my strong belief that it does not belong in the Defense Department budget. • “Finally Mr. President, the Services report that the amount of equipment and its readiness in their Guard and Reserve units is so high that they have a serious need for new facilities to store all the equipment. Yet, the Appropriators provided the Guard and Reserve with a $1 billion in unrequested, unauthorized funding for ‘miscellaneous equipment.’ I’m sure certain States who are on the Appropriator’s short list will be very pleased to have the money directed their way – I’m not so sure about the taxpayers. “It is quite a list. Some of these programs may have merit, but none them were requested by the Defense Department. This should be instructive to my colleagues since the Pentagon – certainly no shrinking violet – tends to ask for what it needs. But in these times, Secretary Panetta is looking at every program to determine how he can achieve the enormous cuts of over $450 billion that the President has already ordered him to take. Thus, every dollar that Congress adds that is not a priority for the Pentagon makes the burden of funding the Pentagon’s real priorities that much more difficult. “Mr. President, if the Senate had done its job and allowed for appropriations bills to be considered in regular order, I would have offered a bipartisan amendment, cosponsored by Senator Rockefeller and 13 other Senators, to the Financial Services Appropriations bill. This important amendment would have prohibited bonuses for Senior Executives at Fannie Mae and Freddie Mac while they are in taxpayer-backed conservatorship. “Since they were placed in conservatorship in 2008, these two Government Sponsored Enterprises (GSEs) have soaked the American taxpayer for nearly $170 billion in bailouts. And recently Freddie Mac and Fannie Mae requested an additional $13.8 billion more that is coming out the pockets of hardworking Americans – many of which are underwater on their mortgages. “With that in mind Mr. President, it is unconscionable that their federal regulator had the audacity to approve $12.8 million in executive bonuses – to people who make $900,000 per year! This body should be ashamed if we let this happen again – especially in these tough economic times. Every day more and more Americans are losing their jobs and their homes and we’re allowing these people to take home annual salaries of $900,000 and bonuses of $12.8 million – all while they ask the taxpayers for billions more in bailout money. “Even more alarming is the justification for these outrageous bonuses by Edward DeMarco, the acting director of the FHFA. Mr. DeMarco argues that – in order to get the best people in place – we need to pay them outrageous amounts of taxpayer dollars. Well, I’m not buying that argument. It is ridiculous to tell the American taxpayer ‘look … we lost a bunch of your money – so we need to pay these smart guys millions of dollars of your money so that we don’t lose the rest of your money.’ The American people are smart enough to see through that sham logic and they are angry. • “The President’s Cabinet Members make $199,700 a year. “While millions of Americans are out of work, underwater on their mortgages, and losing their homes, we cannot justify paying millions in unnecessary, unearned bonuses with their hard earned tax dollars. However, due to lack of priorities in the Senate, I was never able to offer my amendment. “Mr. President, if the Senate would have done its job and moved forward in regular order with the Energy and Water Appropriations bills, I would have offered an amendment that would require a top-down review of non-competitive contracts issued by the Army Corps to Alaska Native Corporations (ANCs). “We need to be especially mindful of how taxpayer dollars are appropriated to the Army Corps in light of a recent Justice Department investigation that revealed what prosecutors call ‘one of the largest bribery scandals in U.S. history’ involving Army Corps contracting officials and the contracting director of Eyak Technology, an ANC-owned company. “This particular ANC company, EyakTek, saw their employee fraudulently inflate quotes for IT services and billing the Army Corp about $20 million, which was then paid as kickbacks that were used to buy real estate, BMWs, fancy watches and clothing, and first class airline tickets around the world. “Congress can’t allow these kinds of brazen abuses go unanswered. Unfortunately, leadership yanked the Energy and Water appropriations bill from the floor just a few weeks ago and my amendment was never considered. “In addition, I would have offered an amendment to the Energy and Water Appropriations bill that would have ensured that private investors are not put before taxpayers in the event of a default of a loan guarantee – as happened with the Solyndra loan guarantee championed by the Obama Administration. “At the urging of energy industry lobbyists, the Obama Administration reinterpreted section 1702 of the Energy Policy Act of 2005 regarding the general terms and conditions for loan guarantees. This reinterpretation allowed the Secretary of Energy Steven Chu to restructure loan guarantees and in some cases, such as with Solyndra, place private investors before taxpayers in the repayment line in the event of a default by a loan recipient. “In the case of Solyndra, private investors will collect the first $69 million that can be recovered from the company; taxpayers that were placed in a second class position by DOE may collect the remaining proceeds, if any. “It was never the intention of Congress to make taxpayers subordinate on these loan guarantees. In fact, it was the intent of Congress to do the exact opposite and keep taxpayers at the front of the repayment line. “This was a sensible amendment to clarify that in the event of a default of a loan guarantee, taxpayers are at the front of the line for repayment. Unfortunately, given the broken process the Senate is operating under, I did not have the opportunity to offer it. “While I do think it is essential that every agency including the GAO eliminate wasteful spending, I believe it is in the best interest of this body to ensure that the GAO has the necessary funding to aid Congress with its oversight responsibility. “Mr. President, the American people are struggling through record unemployment and are under unprecedented fiscal pressure. They need strong leaders willing to make tough decisions to restore fiscal discipline and responsible governance. The Armed Services Committee went to great lengths this year to authorize defense spending for the most critical national security requirements as proposed by the President and Defense leadership. Nevertheless, the Appropriations Committee has reported a bill that improperly appropriates without authorization $3.5 billion for unrequested programs for the Department of Defense and in some specific cases, such as funding for Guam’s non-Defense civilian infrastructure projects, directly contradicts the explicit limits provided by the FY 2012 Defense Authorization Conference Report. “I say to my colleagues that we can do better. We can and must improve the process of authorizing and appropriating. Since we know what the problem is, we must now fix it by allowing the authorizing committees to bring their bills to the floor and actually authorize federal spending. The appropriations bills – all of them – should reflect the will of the authorizing committees. I intend to work with my colleagues to remedy this problem. The will of all Senators, not just a select few, should be represented when we pass appropriations legislation. Deja Vous - Haven't we been here before? Navy Abandons It's Dead, or Honors Them?